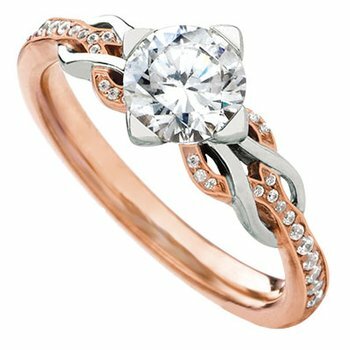 From our MaeVona Collection comes this beautiful 18k white gold and rose gold double loop shank semi mount engagement ring with a cz center. This pretty and feminine Eriskay double loop is the newest design in the Eriskay collection, inspired by the Scottish Island. This semi mount has approximately .15cttw comprised of (34) .0045ct round diamonds.